The United States Mint made the 2011 America the Beautiful Quarters Proof Set available today, March 17, at noon ET for $14.95, plus shipping and handling. The annual set is priced exactly the same as the 2010 and 2009 releases, although the 2009 set did contain an extra quarter. The proof set contains five quarter-dollars, each with unique reverse designs to honor national sites of the United States. This year’s America the Beautiful Quarters® depict emblematic images for Gettysburg National Military Park in Pennsylvania, Glacier National Park in Montana, Olympic National Park in Washington, Vicksburg National Military Park in Mississippi, and Chickasaw National Recreation Area in Oklahoma. The composition of the quarter-dollars is just like circulating coinage, 8.33 percent nickel with the remainder being copper, except the coins in this set are struck to the numismatic "proof" standard. Proof coins undergo special manufacturing to attain the extraordinarily brilliant finish and sharp relief. The coins that are struck for circulation are produced in either Philadelphia or Denver, and therefore have "P" and "D" mint marks. The quarters will be sealed in a protective lens and the packaging will include a Certificate of Authenticity. If the proof set seems familiar, that it because the same exact coins were also issued within the annual 2011 Proof Set which was released on January 11 for $31.95. This set also includes this year’s four Presidential Dollars as well as proof versions of the other 2011-dated circulating coins — the Native American dollar, Kennedy half dollar, Roosevelt dime, Jefferson nickel and the Lincoln cent. Either set may be ordered at http://www.usmint.gov/catalog and 1-800-USA-MINT (872-6468). Hearing and speech-impaired customers may call 1-888-321-MINT (6468). 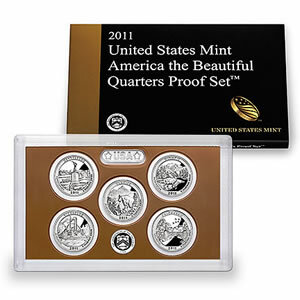 The 2010-dated America the Beautiful Quarters Proof Set is also available while supplies last. Collectors have purchased 262,163 of them, according to the latest US Mint sales figures as of March 13.